Spring is the perfect time to start composting or ramp up production of nutrient rich soil in your existing compost pile. A healthy compost pile will be moist, and have a good balance of carbon to nitrogen and a regular supply of oxygen. If your compost isn’t breaking down, it’s because one or all of these things are missing. Compost piles should be layered with veggie/fruit waste and a carbon source like leaves. The material should be aerated regularly, every week ideally. This can be done with a shovel, but a soil turner is easier to use. If the compost seems too dry you can add some water to it on a weekly basis, as well. Why should you compost? Because leaving your veggie and fruit waste in the garbage creates methane gas, increases landfill leachate production, takes up space in the landfill, costs money to transport, and wastes the nutrient content of the food. In the oxygen deprived environment of the landfill, organics don’t get a chance to break down into compost or soil; rather, they slowly decompose and release methane gas in the process, which is a greenhouse gas 21 times stronger than carbon dioxide when related to climate change. All landfills create leachate, but leachate production can be limited by the amount of moisture present in the waste. Organics contain over 60 per cent moisture (by weight), which turns into leachate as the organics decompose. The leachate travels through the other waste in the landfill and collects contaminants. If the landfill doesn’t have a leachate collection system these contaminants could move into the land; if the landfill does have a leachate collection system the contaminants must be managed or removed, which is a costly process. The lifespan of a landfill is measured in volume by how many years of waste will fit into the existing landfill footprint. If we are able to reduce the amount of waste going into each of our landfills, it gives us more years of use—an excellent reason to divert as much as we can from our landfills. Organic waste is heavy because of the moisture content, and waste disposed of at transfer stations is hauled to a regional landfill, which is paid for by the tonne. This is another good incentive to divert the heavy organics out of our garbage and into our yards. The nutrients from food waste cannot be harnessed if they are mixed up in landfill leachate, but they can in your compost. Even if you only turn your finished compost out onto your lawn or place it around the base of the trees or shrubs in your yard, the nutrients will be put to good use. The CRD and its member municipalities want to help you change your food waste disposal habits and, if there is enough interest, will be offering subsidized backyard composters and counter top containers again in 2016. Email talktrash@cariboord.b.c.ca to get the details or call the CRD at (250) 392-3351 or toll free 1-800-665-1636. Waste wise education is delivered to students in the CRD, but the CRD would like to make waste education available to everyone, as we all have the ability to change our waste handling habits for the better. 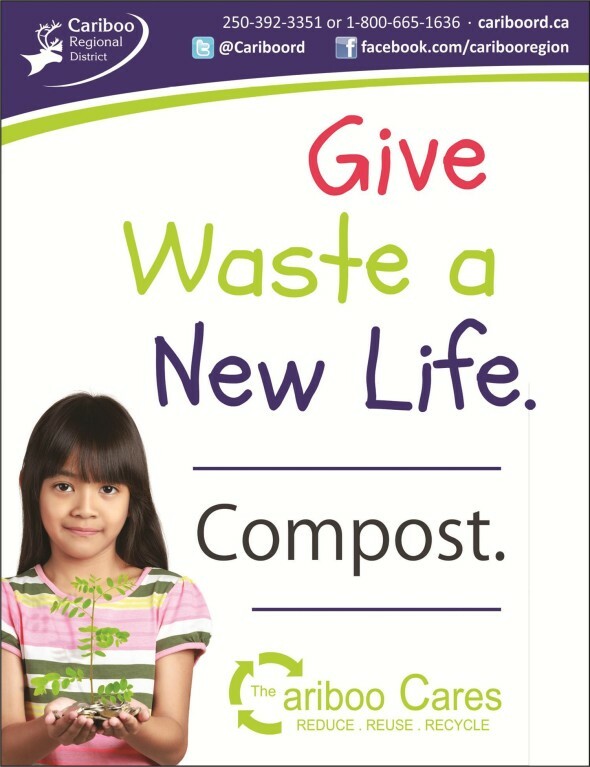 For more info on Waste Wise call (250) 398-7929 or find details on Waste Wise activities and events at www.ccconserv.org. Please join us this year to become waste wise and make a difference. For direct access to our monthly topics “Like” us on facebook at www.facebook.com/caribooregion, check out www.cariboord.bc.ca, or look for our articles in your local paper.